Get on I-95 South. Go right on I-295. Go approximately 24 miles to Exit 10 which is US Hwy 17. Go right. That is due south. Go approximately 37 miles to the Town of Palatka. As you come into Palatka look for a right split which is US Hwy 19. Go approximately 1 mile on 19 to the intersection with St Rd 100. Turn right on 100 and the Holiday Inn Express is between the Sleep Inn and Lowe’s on the left hand side. Take the I-295 Exit south to Orange Park and I-95. Go approx. 12 miles to Exit 10 and take the right exit. Follow the directions above to Palatka. Go north on I-95 to Exit 305 which is St Rd 206. Take the exit and go left on 206. 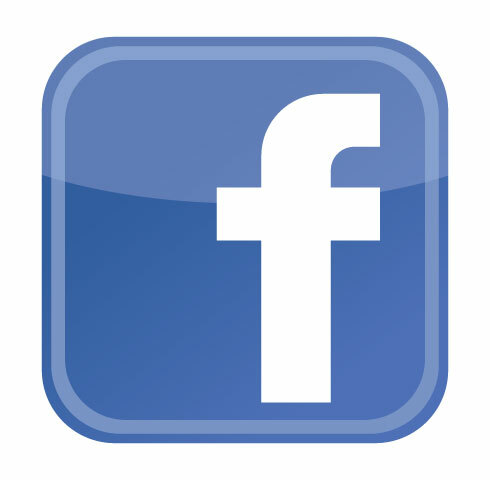 Follow 206 until it merges with 207 then follow it all the way to US 17/St Rd 100. About 18 miles. Turn right and go through the town of Palatka. St Rd 100 veers off to the left. Watch for the signs. On St Rd 100 go about 1 mile and it will cross Hwy 19. Go straight and the Holiday Inn Express is on the left. Come up on I-75. In Gainesville or before, get on US 301 north to Starke. In Starke take a right on St Rd 100 and follow it all the way to Palatka to the Holiday Inn Express which will be on the right. 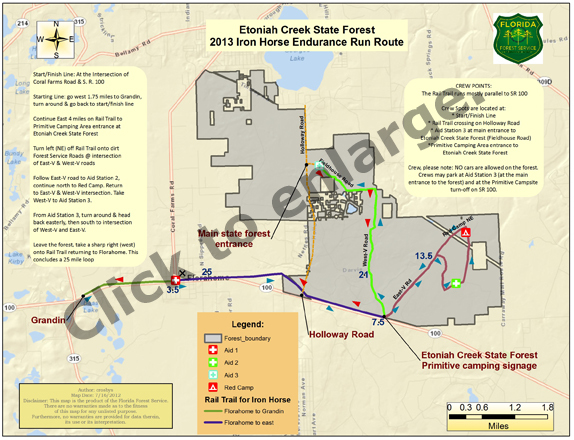 NOTE: You will pass through Florahome which is the start for the Iron Horse series of races. Real simple. The course parallels St Rd 100. Take a left out of the Holiday Inn Express, go 13 miles to Florahome. The parking and start is on the right. It is the corner of St Rd 100 and Coral Farms Rd. and has a flashing yellow light. The starting line is at the intersection of Coral Farms Rd and St. Rd 100 in Florahome. Parking will be available on the side of the road and around the block. The Rail Trail course goes west 1.75 miles to Grandin and then you turnaround and go back to Florahome. That is 3.5 miles. The S/F line aid station is Aid St 1. You continue east 2.25 miles on the Rail Trail to Holloway Rd.There veer left to the powerline easement and continue east 1.75 miles to Aid St. 2 at the Primitive Camping Area entrance to the Etoniah Creek St. Forest. That is 7.5 miles into the course. This is the intersection of East V and West V roads. You will take the right fork which is East V Rd. The trail will be marked with pink surveyor’s ribbons and yellow plates. Follow the road to the primitive camping area and to Aid St 3 which will be unmanned and have only water. You continue on to Red Camp and return to the intersection of East V and West V road. That is 13.5 miles into the course. Then take West V road to Aid St 4 at the main entrance to the Forest. This aid station also will be manned with full food and drink. Note: there are bathroom facilities at both Aid 3 and 4 and a Porta pottie at Aid St 2.. From Aid St 4 turn around head back to the intersection of West V and East V Rds. That puts you 21 miles into the course. Leave the Forest, take a right onto the powerline easement, go to Holloway Rd and cross on to the Rail Trail and return to Florahome. That will be a 25 mile loop. 100 milers get to do it 4 time, 50 milers twice and 100km 2.5 times. For all runners who want to do a training run call 386-329-2552 or email: paula.lott@freshfromflorida.com to let the Forest Service know you are coming. This for safety reasons. Note that the Rail Trail runs parallel to St Rd 100. 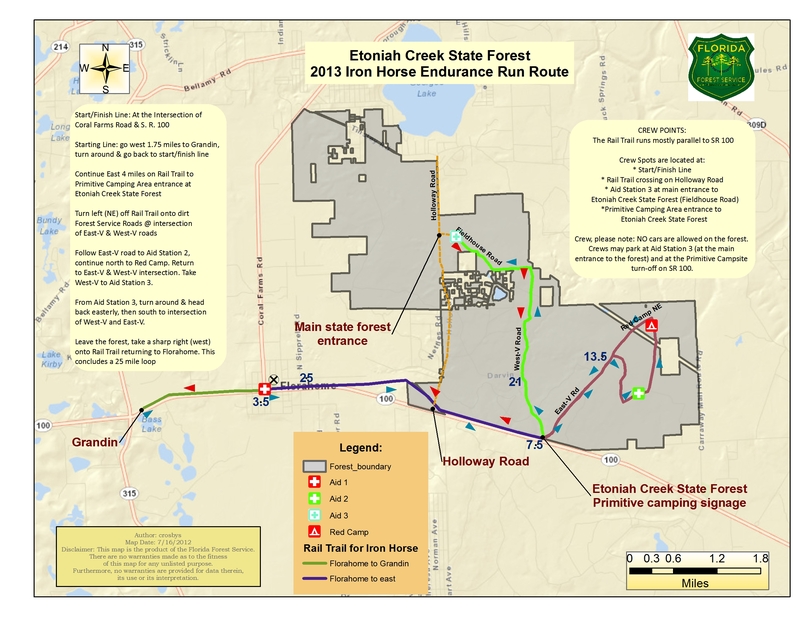 Crew spots are at the S/F area, Holloway Rd crossing, the main entrance to the Etoniah Creek St Forest on Holloway Rd at the Aid St 4 parking lot, and the race entrance to the Forest at the Primitive Camping sign on St Rd 100 4 miles east of Florahome at Aid St 2. Note also that no cars are allowed in the forest past Aid St 2 or past Aid St 4.